10.05 hrs – Here we are, at the Lonavla junction! Kaka dropped us here after giving his mobile number, if we need any help and giving us some info about the places to visit as well as how to get a vehicle to go around and things like that. We bid a bye to kaka and the first thing that came to our notice are the Chikki shops around the place. As far as my eye sight goes, the only shops which I can see are the chikki shops. Chikki is a candy made up of jaggery and peanuts usually. But people do prepare these candies with other stuff like sesame, chana dal (chick-peas) etc. And Lonavla is famous for it’s chikki. Don’t forget to buy some when you visit this place next time 🙂 . Kaka asked us to inquire with the auto-rickshaw people to go around the places and he told that usually they charge Rs. 500 to 600 for a trip. When we approached an auto driver and inquired, he asked us to pay him Rs. 1200, exactly double the amount which Kaka told us! 11.00 hrs – We asked the auto driver about AXIS Bank, coz this is the only bank which don’t require a pass-book to withdrew money and he told us that it’s a 10 min walk from there. We walked towards the bank only to hear the answer that there was no cash available with the bank. We wanted to give a last try. If we could get some money from the ATM of State Bank of India, we would go around here or otherwise we would be heading directly to Pune. We reached the bank and there were 3 queues with some 100 people in each of them waiting for their turn either to deposit the old bank notes, or to withdraw money from the bank or from the ATM. 11.30 hrs – We too stood in the ATM queue and waited for our turn. The twist in the story was that the ATM was closed, none knows when it is going to be opened or is it going to be opened at all? It’s just a hope that it would open sometime 😀 . When inquired about the same with the security guard, he always used to show me his index finger and the middle finger! I could never understand, what it meant, I mean is it that the ATM opens at 02.00 PM or in another 2 hours! Waited for another hour in the queue till the time we got exhausted. We gave up our quest for money 😦 . Headed to a small eatery shop and ordered for some vada-pav and decided to leave to Pune! 12.45 hrs – Something clicked in Mythri’s mind. She called up her cousin to find about the Rs. 500 she has lent to him and found that he kept the same in the book in Mythri’s bag. She made a thorough search and at last found Rs. 400! Yippee!! Another Rs. 400 added to our reserve. Now the dilemma crept in. Should we bargain hard and fix the trip at a cost of Rs. 600 and save the rest for our onward journey or should we save all of it? 13.20 hrs – After having a vada-pav, my brain started to work sharp I guess 😉 :-p . I told Mythri about the plan that was running in my mind. It was to ask the auto-driver to accept our debit-card and swipe it at any one of those chikki shops or the hotels or any petrol-pumps and get the money! We were elated with our idea and headed towards the auto-junction and we found the same driver with whom we had a bargain in the morning. But to our utter disappointment he wasn’t of any help 😦 . We lost our hope again! We opted a cab drive for two reasons, one – this is the fastest way to reach Lonavla, two – the road is one of a kind and we must try it at least once! Though we got another co-passenger, kaka was not happy and wanted two more passengers to carry on with the drive. As we were waiting, two more guys joined us on the back seat, while Mythri and I occupied the middle seats and another girl occupied the front seat. 8.30 hrs – It took us half-an-hour to hit the Expressway and just for info, an expressway is a controlled-access highway; it is a highway that controls entrances to it and exits from it by incorporating the design of the slip roads for entry and exit into the design of the highway itself. 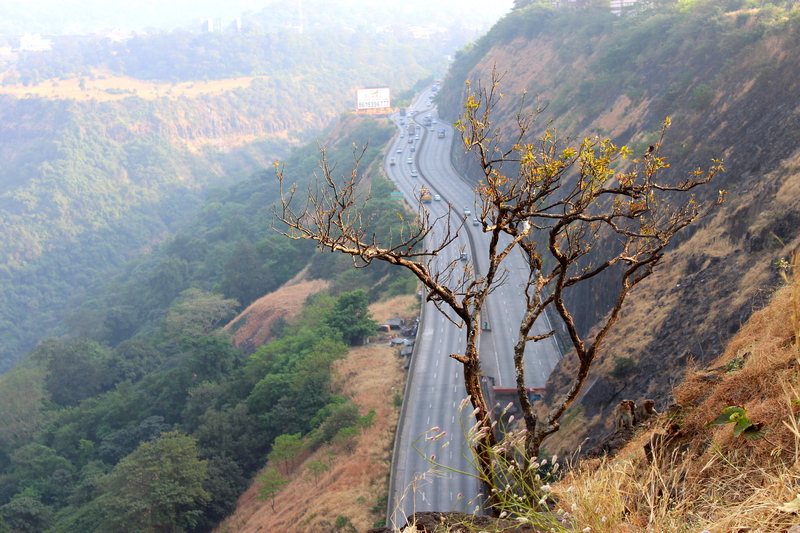 The Mumbai Pune Expressway, officially the Yashwantrao Chavan Expressway is India’s first six-lane concrete, high-speed, access controlled tolled expressway. It spans a distance of 93 km (58 mi) connecting Mumbai with Pune. This expressway has reduced the travel time between the cities of Mumbai and Pune to approximately two hours and also reduced the traffic on the Mumbai-Chennai highway. The drive along this road is smooth as well as fast and soon we were to find why this is one of the most beautiful routes in India. The road makes its way through the Sahyadri mountains, a part of the Western Ghats and the smooth road offered us a magnificent view of the rolling hills which are draped with a blanket of brown-colored vegetation, leaving us to our own imagination of these during the monsoon. Am sure that, the road offers magnificent views of the lush green hills, verdant valleys, waterfalls and lakes during the rainy season and making the beauty of this route one of its kind 🙂 . Looking forward for one such views!